I am doing my IREX in a two weeks time and Just finished the timed practice exam and scored 88% for IREx, I am pretty happy with it. 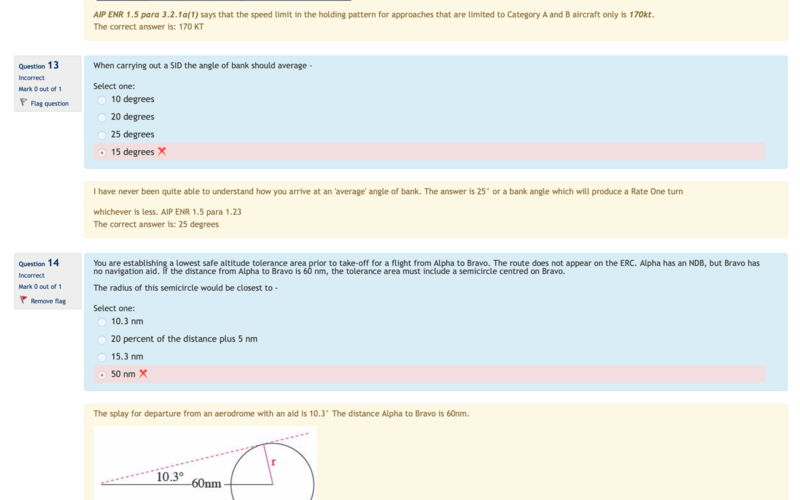 Just got one question I couldn't quite get around, from you SID section in your IREX book, page 220 Q22, when carrying out a SID the angle of bank should average, the answer is B which is 15 degree but your practice exam says it should be 25 degrees or rat one turn?? I am a bit confused? Thank you very much in advance for your help and clarification. By definition, a rate one turn is accomplished at 3°/second or 360° in two minutes. Last Edit: 2 months 1 week ago by Stuart Tait.